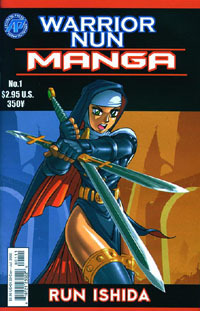 The Warrior Nun series had a long life in the American comic book scene. It’s popularity led to additional projects, including planning of an animated series and a manga released in Japan. The manga, while featuring a similar-looking main character, is quite different from it’s American predecessor. The story revolves around Sister Sakura Mizutakchi (renamed from Shannon Masters, the look alike from the original series), a new teacher at a Catholic school. However, she’s more than a simple sister. Sister Mizutakchi is a warrior nun, which immense physical (and spiritual?) powers which she uses to rescue a student from the hands of a sinister demon. The story is much more traditionally manga in format than Dunn’s comics. The series is black-and-white and the characters always look like manga characters, unlike the mishmash in Warrior Nun Areala. The setup, too, is familiar, as our hero is surrounded by snobby girls and an injured, mysterious, and antisocial one. The end of the manga reveals that there are secrets within the school and that Sister Mizutakchi may be surrounded by unexpected enemies. Unlike volume one of the Dunn’s original series, the manga doesn’t focus on giving too much background (or providing too many characters) in its opening. And as such, it works well as the opening tale for a series, providing a fun protagonist, and antagonist that may return (she is identical to Lillith from Warrior Nun Areala), and hooking us for future volumes. Unfortunately, like I mentioned, the series appears to have been discontinued. Dunn himself, in the manga’s opening, claims that he doesn’t know much about how well the comic sold in Japan. Another nice touch is that Antarctic Press, while printing in the left-to-right style, provides several pages in the conclusion that show how the series looks in the traditional right-to-left manga format. It’s interesting to see the reflection of images and how the words fit into the different styles. We’ll never know where this story was headed or if the the magaka would have continued to craft an interesting tale. But for what it is – a short introduction to the series – Warrior Nun volume 1 delivers as a fun and captivating read.